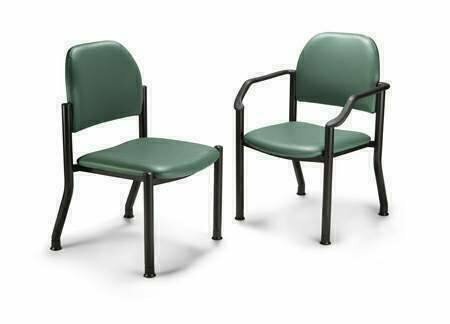 Soft and comfortable seating for your patients in the exam room, waiting room and front office Wall saver kickback leg design that allows the chair to be close to the wall without damaging it Back Cushion: 18 W X 13.5 H Inch, Inside Arm: 17.5 Inch W, Outside Arm: 23.5 Inch W, Leveling Feet. Back Style : Contoured Back, Frame Material : Powder Coated Black Steel Tube, Material : Vinyl, Back Style : Contoured Back. View More In Chair Arms.